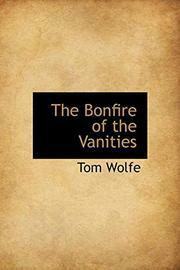 Sheer entertainment against a fabulous background, proving that late-blooming first-novelist Wolfe, a superobserver of the social scene (The Kandy-Kolored Tangerine-Flake Streamline Baby, Radical Chic and Mau-Mauing the Flak Catchers), has the right stuff for fiction. Undertaken as a serial for Rolling Stone, his magnum opus hits the ball far, far, far out of the park. Son of Park Avenue wealth, Sherman McCoy at 35 is perhaps the greatest bond salesman on Wall Street, and eats only the upper crust. But millionaire Sherman's constant inner cry is that he is "hemorrhaging money." He's also a jerk, ripe for humiliation; and when his humiliation arrives, it is fearsome. Since this is also the story of The Law as it applies to rich and poor, especially to blacks and Hispanics of the Bronx, Wolfe has a field day familiarizing the reader with the politics and legal machinations that take place in the Bronx County Courthouse, a fortress wherein Sherman McCoy becomes known as the Great White Defendant. One evening, married Sherman picks up his $100-million mistress Maria at Kennedy Airport, gets lost bringing her back in his $48,000 Mercedes-Benz, is attacked by two blacks on a ramp in the Bronx. When Maria jumps behind the wheel, one black is hit by the car. Later, he lapses into a terminal coma, but not before giving his mother part of Sherman's license plate. This event is hyped absurdly by an alcoholic British reporter for the The City Light (read: Rupert Murdoch's New York Post), the mugger becomes an "honor student," and Sherman becomes the object of vile racist attacks mounted by a charlatan black minister. Chunk by chunk, Sherman loses every footing in his life but gains his manhood. Meanwhile, Wolfe triumphantly mounts scene after magnificent scene depicting the vanity of human endeavor, with every character measured by his shoes and suits or dresses, his income and expenses, and with his vain desires rising in smoke against settings that would make a Hollywood director's tongue hang out. Often hilarious, and much, much more.